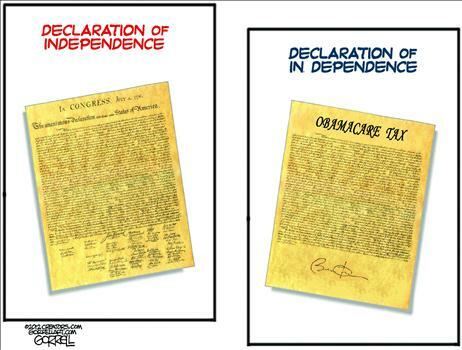 I posted five good Obamacare cartoons last week (and included two others in this post and this post), and was planning on stopping there. 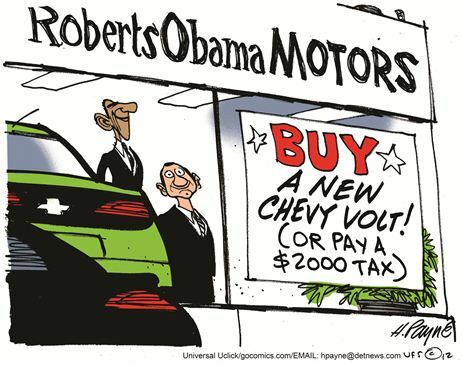 But the cartoonists have come out with a lot of good material, so let’s enjoy this new material. 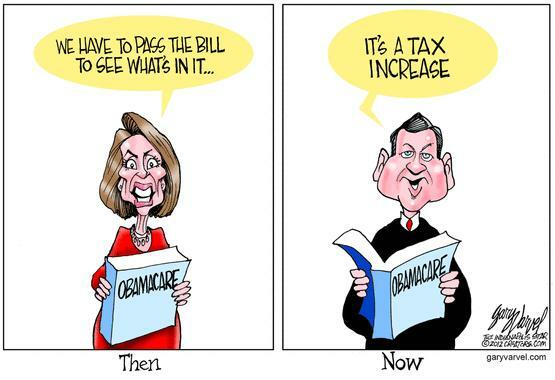 After all, we deserve a few laughs before we deal with the pain of more spending and higher taxes. Let’s start with my favorite, which is very appropriate for today. Sticking with that theme, here’s one that uses the Constitution instead of the Declaration of Independence. 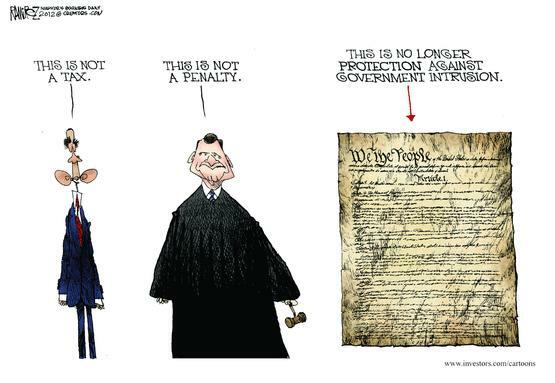 Since the last two cartoons have mocked Chief Justice Roberts, let’s continue with that theme. By the way, I can’t resist adding a bit of what Thomas Sowell just wrote. …there are people in Washington — too often, Republicans — who start living in the Beltway atmosphere, and start forgetting those hundreds of millions of Americans beyond the Beltway who trusted them to do right by them, to use their wisdom instead of their cleverness. …ObamaCare was an unprecedented extension of federal power over the lives of 300 million Americans… These are the people that Chief Justice Roberts betrayed when he declared constitutional something that is nowhere authorized in the Constitution of the United States. …What he did was betray his oath to be faithful to the Constitution of the United States. 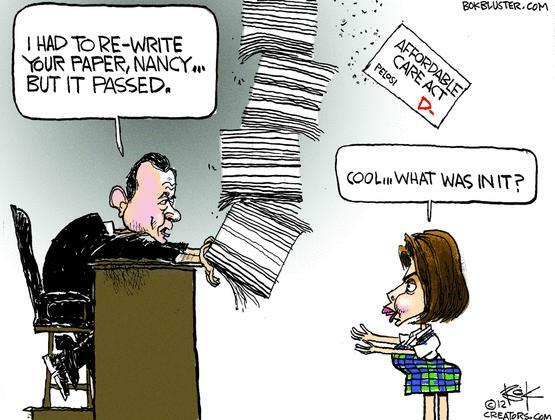 Now let’s go with the theme of mocking Both Roberts and Nancy Pelosi. She’s an easy target, having become infamous for utterly inane comments, so let’s pile on with another. 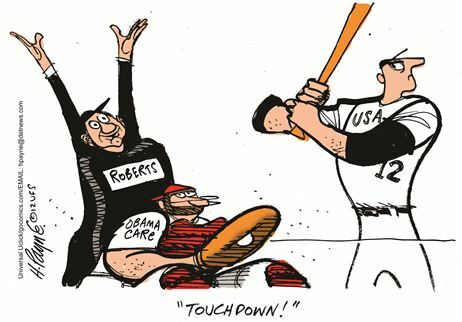 Now let’s look at another good cartoon, but this one should worry us because it shows the door that Roberts opened. This seems over the top, but 15 years from now, we’ll look back at this cartoon with better (and bitter) understanding. 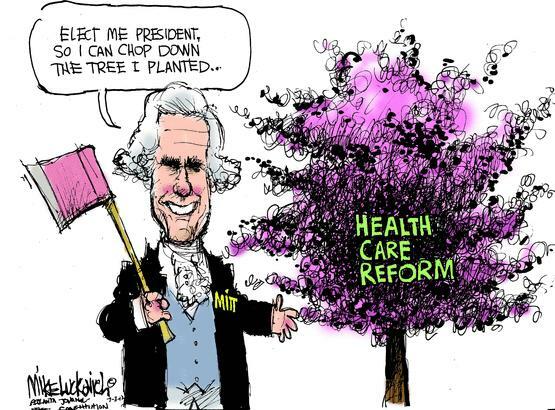 Last but not least, here’s a cartoon that should worry Republican readers. I’ve already explained why Mitt Romney is not a proponent of liberty. 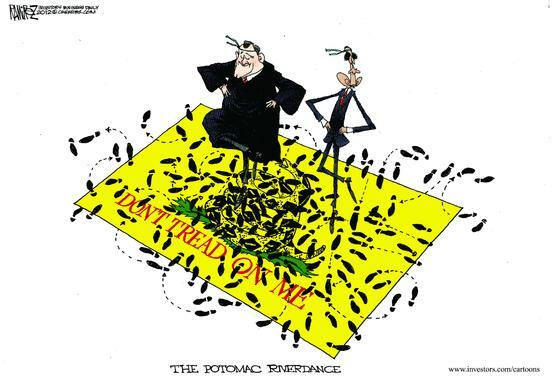 This cartoon underscores that sentiment and also shows why he will have a problem going after Obama on this issue. But that’s a depressing way to end this post, so put all the statists out of your mind. Go out and enjoy the 4th, ideally with some illegal fireworks to show that the spirit of rebellion still exists.